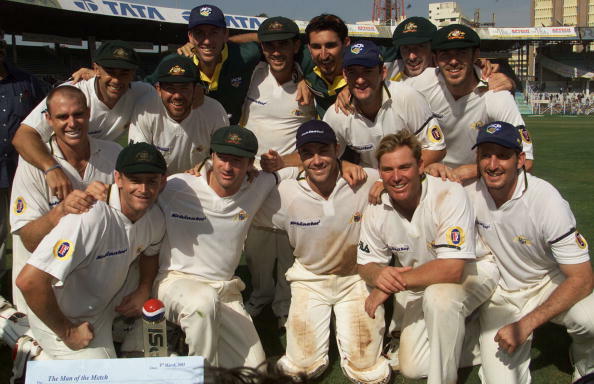 March 2001: The touring Australian team landed in India ahead of their Test series against the hosts. That Aussie team dubbed “The Invincibles” was full of legends. The batting order consisted of Matthew Hayden, Steve Waugh, Ricky Ponting and the bowling trio of Mcgrath, Warne, Gillespie tormented batsmen across the world. Before this series, Aussies had won 15 consecutive test matches and they were the clear favourites to win the series. As expected, India were blown away in the first match of the series and the confidence of both the players and fans were very low ahead of the second Test at Eden Gardens. At Kolkata, Australia won the toss and elected to bat first. The events that transpired in those five days are still fondly remembered by each and every Indian cricket fan. Under good batting conditions, The Aussies got off to a great start. At one point, they were cruising at 212/4 but a teenager named Harbhajan Singh singlehandedly brought India back into the game with a stunning hattrick. Australia ended the day at 291/8. There was a reason why that Aussie team were called as "The Invincibles”. Even when things looked bleak, they never surrendered and once again the Aussie spirit was on show as Steve Waugh hit a century with two tailenders for the company. One common thing about that Indian bowling lineup and the current Indian bowling lineup is their inability to remove the tailenders before they cause any serious damage. The ninth wicket partnership of 132 runs frustrated the Indian bowlers and dampened the spirit of Indian fans. Finally, Australia was dismissed for 445 and the Indian openers strode out to bat. What followed was abysmal batting as the Indian batsmen threw away their wickets and at the end of the day, India was reeling at 128/8 with Laxman fighting a lone battle. The Indians were bowled out for 171 before lunch. There was curiousness as to whether the Aussies will ask the Indians to follow on under hot and humid skies (or) will they go with the safer option of batting again and making India chase? Waugh without any hesitance asked India to bat again and he will regret that decision for the rest of his life. The openers started slowly and added 50 runs before the Aussies struck back. Ganguly trusted his instincts and asked Laxman to bat at No. 3 instead of Dravid and this move by Ganguly is heralded by many experts as one of the best cricketing decisions of this century. Right from the moment he came out to bat, Laxman exuded calmness under immense pressure and played some scintillating strokes to all parts of the ground. There was a touch of divinity in the way he which strode out from his crease and drove Warne through the cover region. 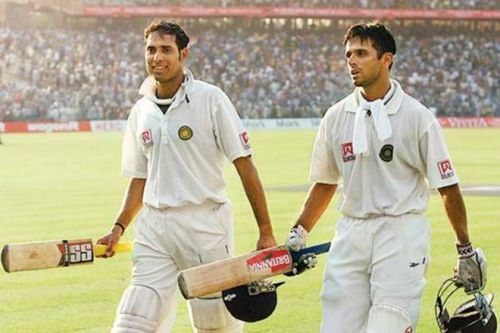 Sachin and Ganguly did not last for long but the manner in which Laxman played gave the tiniest ray of hope to Indian fans. At the end of Day 3, India were 254/4 with Laxman and Dravid remaining unbeaten. The Indians started scoring at a faster rate and at lunch, the scorecard read 376/4 (Laxman 171*, Dravid 50*). By this point, The pitch had flattened out and the Aussie bowlers were showing signs of fatigue. Post lunch, India began to dominate the proceedings as Dravid looked unshakable and Laxman was toying with the Aussie pacers. Soon, Laxman went past the 200-run mark and the crowd in Kolkata started making more noise with each passing over. India ended the day’s play at 589/4 with a defeat now firmly out of the equation. In a single day, India escaped from the jaws of defeat and looked set to have a go at the Aussie batsman on the 5th day aiming at an improbable victory. India decided to attack in an effort to get as many runs as possible in the first hour of play. Laxman departed for 280, probably the greatest innings ever played by an Indian and India set Australia a target of 384. The Aussie openers got off to a 50-run partnership and the test match was heading for a draw. But the Indians fought back and Australia lost three wickets in a short period of time. Even as he ran out of partners, Hayden looked solid in the middle and took Australia to 161/3 at tea on day 5. Steve Waugh and Ricky Ponting soon departed after tea but India desperately needed the wicket of Hayden to force a victory. At that moment, to the surprise of everyone, Ganguly asked Sachin Tendulkar to bowl. The move turned out to be a masterstroke as in his very first over the little master trapped Gilchrist in front and followed it up by removing Hayden in his next over. 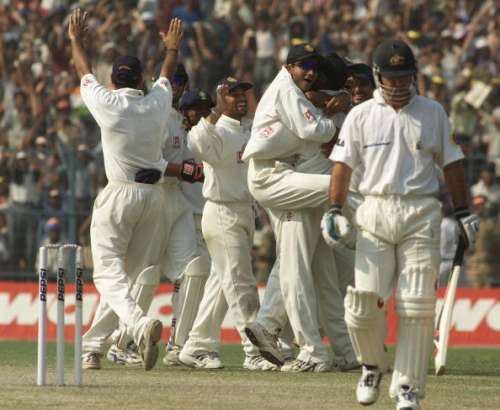 The Aussie tailenders did not last long and when Harbhajan picked up his sixth wicket of Glenn Mcgrath, the whole stadium along with the millions of Indian fans erupted in joy. 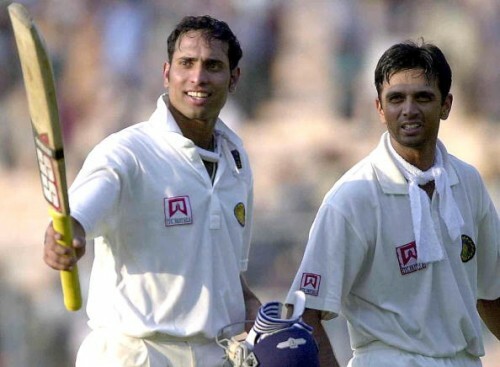 The Indians had achieved the impossible as “The Invincibles” were finally defeated and Laxman became the heartthrob of Indian fans across the globe. After this victory, no team took India lightly and it sowed the seeds for many more memorable comebacks by the Indian team against strong opposition in tough conditions.